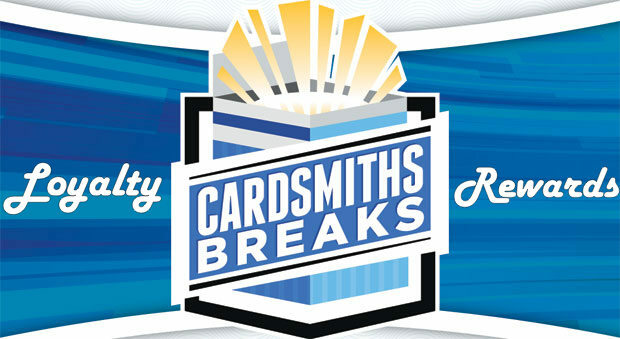 With the new Cardsmiths Breaks Loyalty Rewards Program, you earn points for each purchase you make! Loyalty should be rewarded, and now it is! Every team or slot you purchase at Cardsmiths Breaks will give you back a bonus percentage that you can use right away on future breaks! Even if you hit a monster in a break, the rewards points continue to add up for when you are ready to redeem them. You can redeem these points on purchases automatically in any denomination: 100 points = 1 dollar of store credit! Let it pile up, or use it right away, it’s up to you! When you purchase a break slot, the amount of points you will earn is displayed, as is the option to use your existing points on the purchase. Look for special breaks with Bonus Multiplier Rewards! Make sure you are signed in, as “guest” purchases will not be able to give you your reward points!